"This is my third album... simply... from heart to heart. Any reviewers referred my previous works to space dark ambient and the new album also has a cosmogonic feel to its musical images. This time everything takes place in utterly deep space, in the immense emptiness that contains the whole world. Swinging on slow waves which shimmer in all possible colours we contemplate monumental galactic metamorphoses. Slowly unwinding are the tight spirals of synthesizer drone, rhythmic patterns pulsate and emotional melodies are cut with rare flashes of voice samples. Smoothly flows the sound, charged with energy, transmitting the experience of self-awareness from the musician to the listener... from heart to heart". When dealing with high abstract and deeply individual genres, like dark ambient for example, the artists try to establish a really close connection with the listener. I truly believe that most of the albums that step out of the doors of that scene should be listened in complete loneliness and with a highest concentration on their content when every small sound movement and every tune has its own meaning, reflects a specific emotion or feeling. 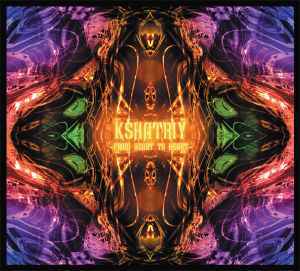 Russian based Kshatriy tries to set the proper connection through his new record 'From Heart to Heart' while transmitting the experience of self-awareness from the musician to the listener. I came across this project few times in the past and was highly impressed by the level of the emotional manipulation in each of his creations, both in stand-alone projects and collaborations with other artists. The third full-length album continues the traditions that were set in previous records and combines the ancient Indian mythology with deep space journeys to create a powerful and winning mixture. Each track is based on some wide melody that drones all around being that glue which connects all the parts together with its highly meditative origin. The drive of the album is gained translationally, without harsh and sudden moves. "Sacred Dimension" starts with a really slow, quiet but still mysterious tone; the tension grows slowly with adding different electronic pulsations, splashes of energy, background voices and so on, when they reach the highest point somewhere by the middle of the track. All the compositions are highly atmospheric, reaching even celestial level by "Crystal Hand". Along with the recognizable techniques from the previous albums, Kshatriy tries to experiment as well, maybe as a part of some evolution process. The second track "Solar Wind" is bound around a heavy ritualistic drumming which I don't remember to present somewhere else. I think it is the best track of the whole album being very fresh and mind-opening compared to all the rest, more close to the tribal ambient genre. It shows that the artist is not stuck exploiting the baggage of old ideas, but seeks for the ways to find different crossover possibilities. One more composition with a slight different approach is "Rainbow Serpent" which is basically build on the same slow spacy ambience but with a fresh addition of didgeridoo solo that rolls over the whole track and reminds of Arbre Noir's "Tibet" live track. Last two tracks reveal a darker side of Kshatriy with a dense and gloomy, still hypnotic sound and mysterious atmosphere. I wasn't impressed by them too much because I expected some more experimentation after hearing those two wonderful tracks that I had really liked. In "Possible Planet" and "From Heart to Heart" the artist continues to concentrate on the depth of the sound, manipulating with tensions and emotions and weaving his web of highly cinematic content. For my opinion, Kshatriy became a hostage of the highest standards that were set in his previous works. I could see signs of evolution in those two tracks that I really liked and I hope that he will adopt those best points in his next albums and will exploit them much more turning this project into something that will stay in my CD-player for many years. The usage of tribal ambient instruments contributes a lot of diversity and will take Kshatriy to the next level of his journey in the future. Meantime, I think that 'From Heart to Heart' is a kind of transition album that left me with a taste of "more to come" when I feel the potential of this Russian fella.